"Software that adopts FMA can theoretically double compute performance"
Please explain why. On Intel's processors, a SIMD multiply instruction plus a SIMD add instruction can be completed every clock. I don't understand how a Fused Multiply-Add (FMA) increases peak performance at all compared to what Intel already does (not even counting 128-bit SIMD vs 256-bit SIMD). I'd like to hear people's opinions about AMD's Heterogeneous System Architecture (HSA). I am struggling to understand how it is possible to have an ISA-agnostic interface (therefore needing a Just-In-Time compiler) without paying a big performance penalty. The whole purpose of heterogeneous computing is to get more performance so why would it make sense to use a Just-In-Time compiler? It seems like the vast majority of software vendors that make use of GPUs for computing only support Nvidia GPUs (for example, Adobe Photoshop, Adobe Premiere and Neat Video). What does HSA provide that could change this situation? Richard H. (no-spam-please.delete@this.gmail.com) on February 7, 2012 7:29 pm wrote: > David Kanter wrote: > "Software that adopts FMA can theoretically double compute performance" > > Please explain why. 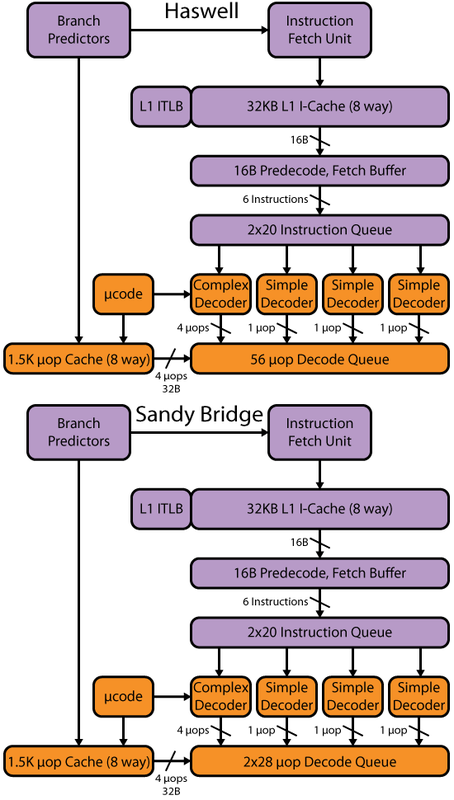 On Intel's processors, a SIMD multiply instruction plus a SIMD add instruction > can be completed every clock. I don't understand how a Fused Multiply-Add (FMA) increases peak performance > at all compared to what Intel already does (not even counting 128-bit SIMD vs 256-bit SIMD). > > I'd like to hear people's opinions about AMD's Heterogeneous System Architecture (HSA). I am struggling > to understand how it is possible to have an ISA-agnostic interface (therefore needing a Just-In-Time > compiler) without paying a big performance penalty. The whole purpose of heterogeneous computing > is to get more performance so why would it make sense to use a Just-In-Time compiler? > > It seems like the vast majority of software vendors that make use of GPUs for > computing only support Nvidia GPUs (for example, Adobe Photoshop, Adobe Premiere > and Neat Video). What does HSA provide that could change this situation?